One of the most interesting of these sources was Edward VI's diary. He came to the throne at the age of 9, and died before he was 16, and was one of the earliest English diarists. The Background section of the Wikipedia article is the kind of introduction that should have been included in this book, but wasn't. The lack is all the more remarkable since, when the book was first published, neither Wikipedia, nor Google, nor the Internet itself would have been available. Just a reminder that this blog has moved to here. I only post stuff here when for some reason the Wordpress site is inaccessible. I moved the blog to Wordpress when the Blogger editor was downgraded and made more difficult to use, though the people at Wordpress seem to be doing their best to make their editor more difficult to use too. You can see the latest posts on all my blogs in the Blogroll sidebar on the right, and those in some of the blogs I like reading too. Yesterday was Bright Saturday, probably better known to Western Christians as Easter Saturday, and it was the day we had arranged to have a farewell service for Fr Athanasius Akunda, who was returning to Kenya after 13 years in South Africa, and a kind of mission rally at the same time, at the Monastery of the Descent of the Holy Spirit at Gerhardsville, west of Pretoria. 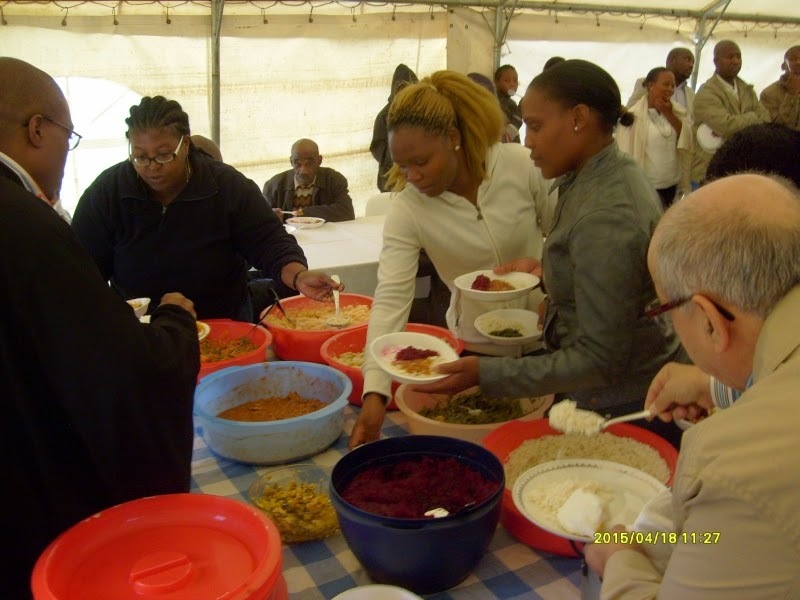 We had arranged to take Grace and Hellen Malahlela, from our Mamelodi congregation, out to the monastery on Friday evening, to prepare to feed the masses. We had no idea how many people might be coming, so we estimated about 100, and hoped that if 5000 turned up, we'd be able to feed them. So on Friday afternoon we set out shopping. Five bags of potatoes, 2 boxes of tomatoes, one box of beans, carrots and spinach for Africa, etc etc. How would we get it all in the car? We looked at gas plates, knowing there was only a small electric stove at the monastery, but in the shop we went to, all the ones displayed were ones that had been returned as defective. We were on our way to another shop when Hellen suggested that they cook it at home, where they had all the equipment and knew what they were doing. We still had no idea of how many pots and pans and serving dishes were at the monastery. So we took Grace and Helen home. They'd had their load shedding in the afternoon, so hoped to be able to cook all night. 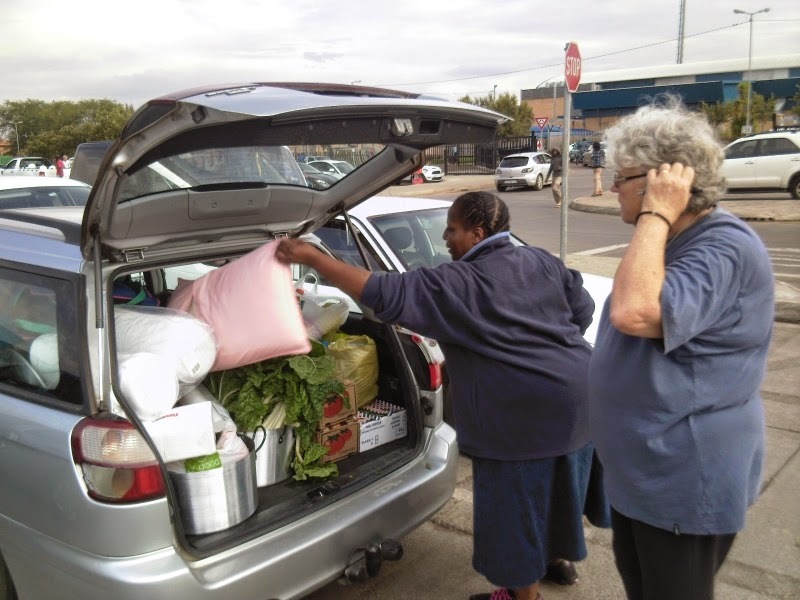 At 5:50 am we set off to Mamelodi to fetch them, and there were rows of plastic serving dishes, with rice, potato salad, macaroni and tuna salad, spinach and all other kinds of good things. No meat, because though it was Bright Week, when there was no fasting, it was also a monastery, and monks don't eat meat. There were no monks, but Fr Elias had urged that we respect the nature of the once and future monastery by observing the monastic fast. Then the chaos began. We were trying to get the church ready for the Divine Liturgy while all the time there were frantic phone calls from people who were coming and had got lost. I had just returned to the vestry from dealing with one of those calls and getting vested when Fr Elias started the Liturgy, and it also became apparent that half the St Nicholas Choir, who were supposed to lead the singing, were lost too. Val had been asked to read the Hours and was about to start when the Liturgy started. So I took off my vestments and went out to join the few who were singing, and trying to negotiate their way to the right places in the service books. Fr Athanasius, the guest of honour, was also not there. His car had broken down, and he had been up half the night repairing it, and it had broken down again in the morning. He was also binging Deacon Pascal Luse, so in the end the service had about five priests, and no deacons. The bishop phoned to say there was an accident on the road and he was delayed, so start without him. Georgia and Azar Jammine arrived in time for the Epistle, which Azar read, and Georgia was able to lead the singing, which immediately improved. But the lost were found, and the church was filled, and we made a joyful noise to the Lord. I hope he forgave our imperfections. Brunch followed. 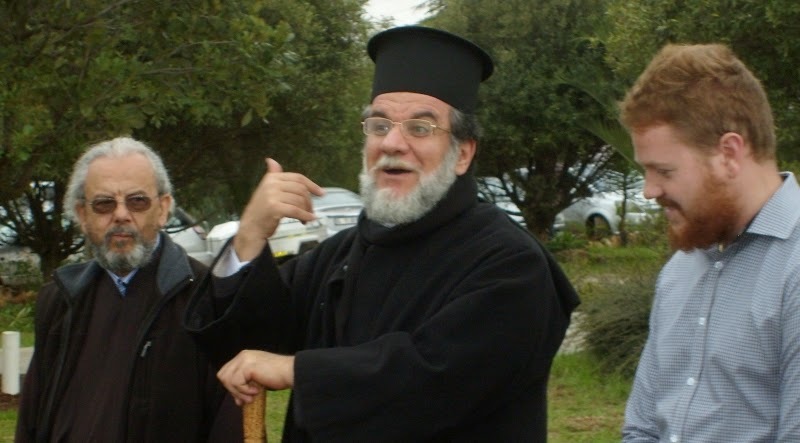 It went quite slowly, in a tent that Fr Elias had hired, and those who had eaten were milling around and thinking of leaving while others were still queuing for food,.We decided to split the speechifying, so Fr Elias spoke first to those who had already eaten, and explained the grand vision for the monastery. 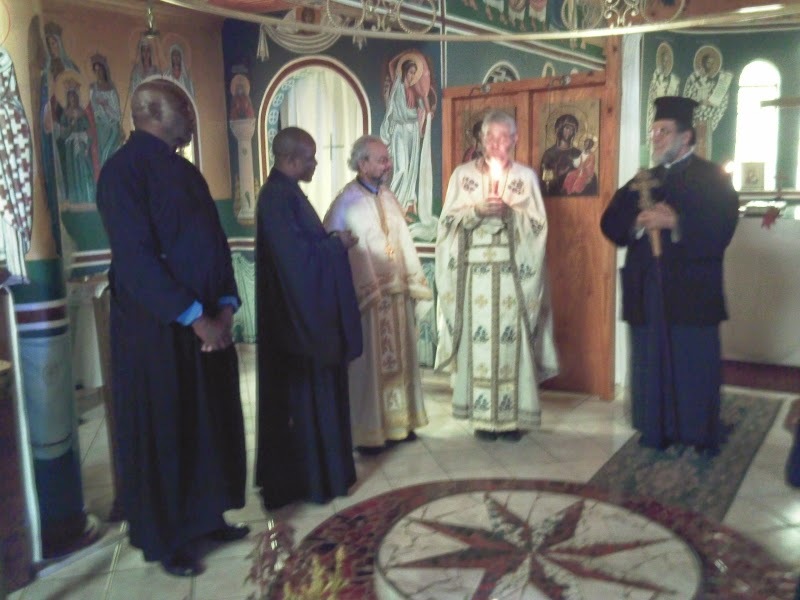 The church where we had had the Divine Liturgy, dedicated to St Demetrius, was just the first of many. It had been built in 2003, and was a kind of parish church, where ordinary people would come. The monastic church would be over the wall to the south, where, for the moment, the donkey Mussolini was making his presence heard by occasional braying. There would be a coenobitic monastery, and a number of small sketes, which could represent different Orthodox traditions -- Russian, Greek, Serbian, Bulgarian, African etc. Over to the west would be a mission, training and retreat centre. And a women's monastery. And somewhere near that would be a seminary. His Eminence Archbishop Damaskinos added a few words, saying that he was already familiar with the vision, and that things were moving forward to achieve it. The thing most urgently needed to fulfil this vision is some actual monks. And a kitchen. Start with a properly-equipped kitchen, to feed the 100 before they grow to 5000. As Fr Elias began to repeat this inside the tent to the second lot of people who by then had just finished eating, I managed to grab some of the delicious food that Grace and Hellen had been up all night cooking. They had truly worked a miracle. Father Athanasius then gave his farewell address, which reminded me of St Paul's exhortation to the elders of Ephesus at Miletus (Acts 20:15-38). I think, like St Paul, that he could fairly say that he had been among us for 13 years, and had held nothing back, declaring to us the whole counsel of God, that he served us in humility of mind and taught everything that was profitable. We hope that a better fate awaits him in Nairobi than that which awaited St Paul in Jerusalem, and that those he teaches at the seminary there, as well as those he taught here in South Africa, will heed the advice that St Paul gave to Timothy: And the things that thou hast heard of me among many witnesses, the same commit thou to faithful men, who shall be able to teach others also (2 Tim 2:2). Fr Athanasius characteristically exhorted us to love one another, and be caring Christian communities who would see that no child was left without education, that we should care for one another and so show the love of God. 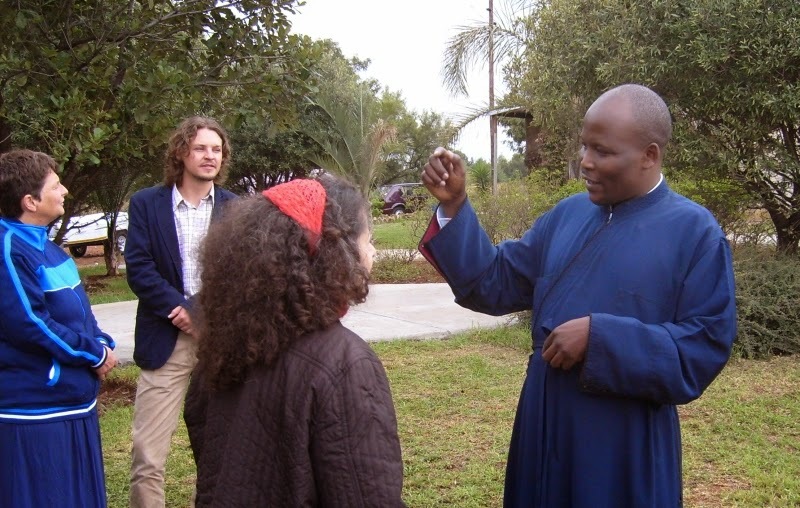 Father Athanasius was asked to come and help when Archbishop August Thamaga of the African Orthodox Episcopal Church, an uncanonical African independent church, asked to be received into canonical Orthodoxy in the Patriarchate of Alexandria. There were no clergy in the Archdiocese of Johannesburg and Pretoria who could teach them in English, so the then bishop, Metropolitan Seraphim, asked Fr Athanasius, then a deacon, who had just completed his studies at Holy Cross Seminary in Brookline, Massachusetts, USA, to come and help. 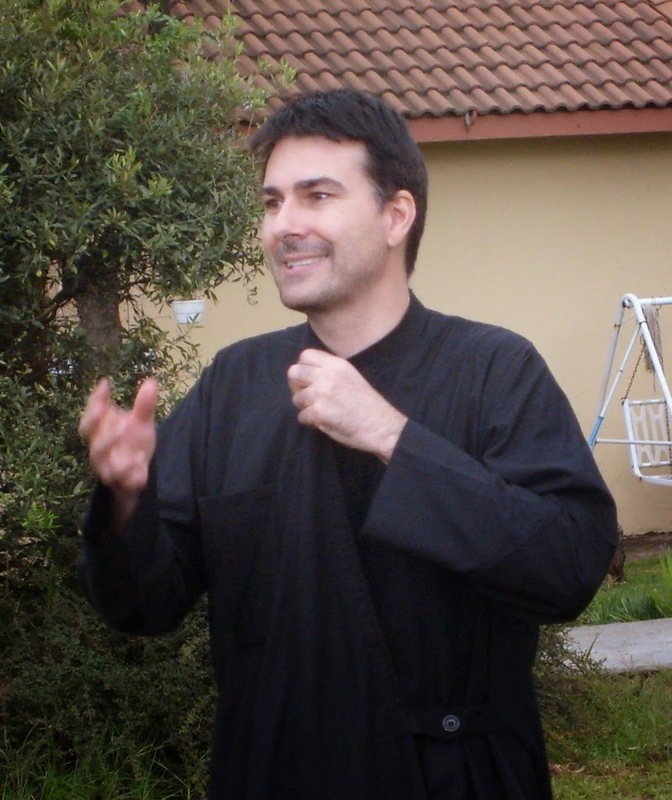 He arrived arrived in May 2002, and was ordained priest a couple of months later. 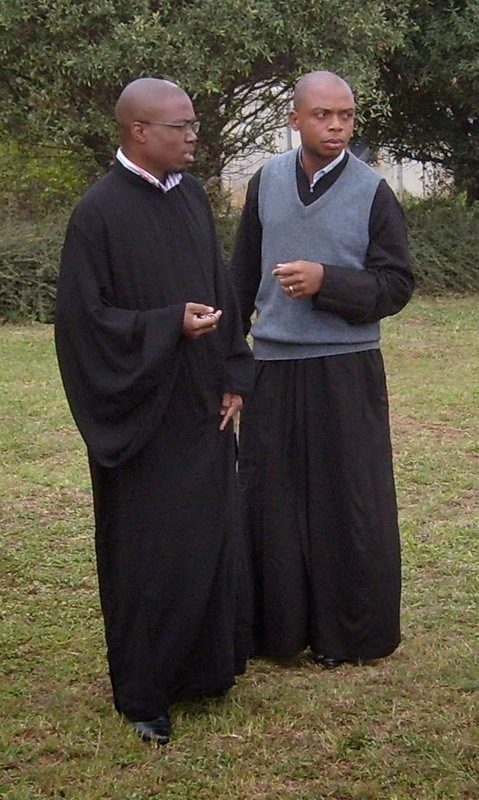 Fr Athanasius worked first in Soshanguve, where Archbishop Thamaga became first a Reader, and later was ordaned, as Fr Simon Thamaga. 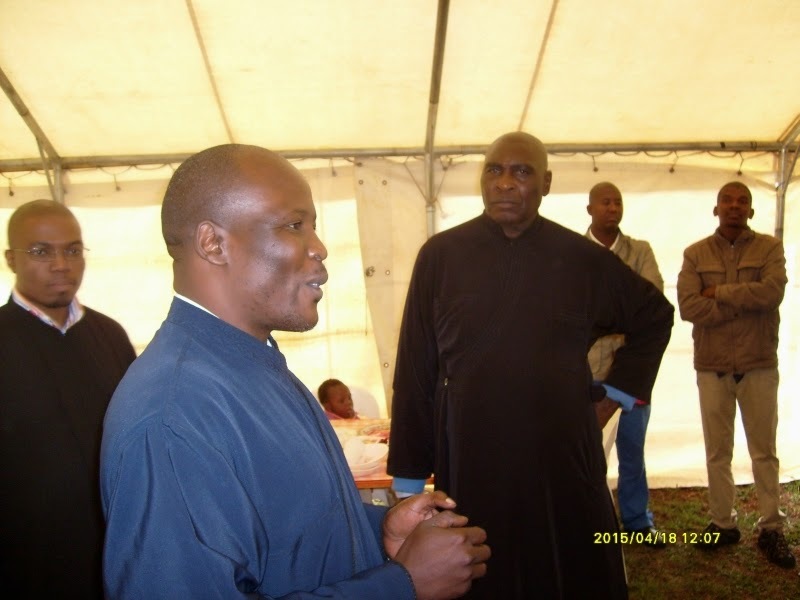 Archbishop Seraphim then asked Fr Athanasius to set up a Catechetical School, to train leaders, and two of the students, Simon Shabangu and Deacon Pascal Luse, also attended the farewell service. The Catechetical School closed in 2009, and after that Fr Athanasius was priest in charge of St Nicholas of Japan Church in Brixton, Johannesburg. 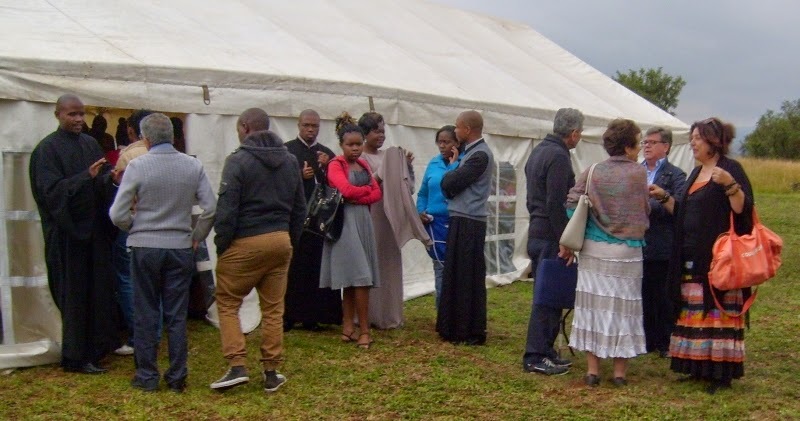 South Africa has been in the news laterly in connection with xenophobia, but the turnout at the farewell service shows that a lot of South Africans, from various communities, loved their Kenyan priest, and Deaconb Pascal Luse came as a refugee from the Democratic Republic of Congo. 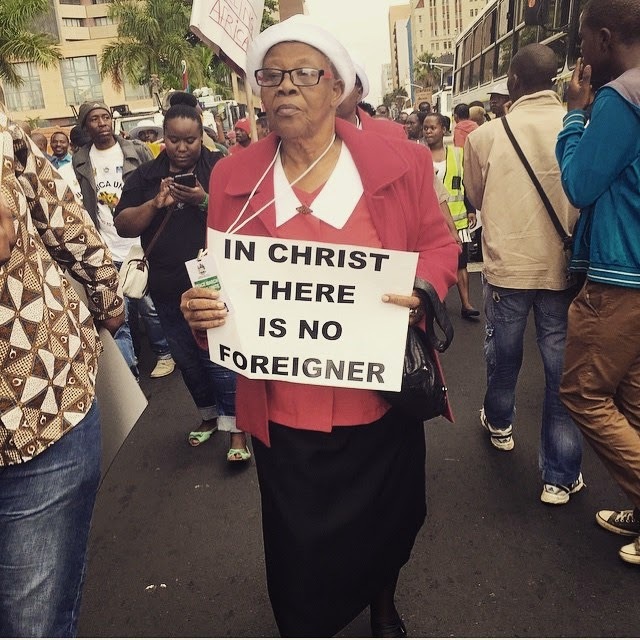 By no means all South Africans are xenophobic and the majority are kind and welcoming. On the way home we discovered why so many had got lost. There are road works along the M26 from Laudium to Gerhardsville, and for the first time the new section through Erasmia was open to traffic. After that we went on detours and sections of the old road to the Gerhardsville turn-off, and one landmark was a narrow bridge with a stop sign, which we had crossed in the morning. But by the time we returned in the afternoon the new section of the road had been opened, and the narrow bridge had been closed off, so those who came after us might never have seen it, and we were referring them to a non-existent landmark. Perhaps it is no more than coincidence, but it struck me today that outbreaks of xenophobic violence seem to coincide with Eskom's load shedding. The last time there was serious and prolonged load shedding was in January 2008, and in February 2008 there was xenophobic violence in Mamelodi. It spread to other places, like Atteridgeville in April, and I blogged about it here: No bread, no matches, no candles — thanks to xenophobia | Khanya. 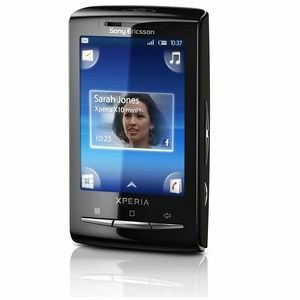 But it was only when it reached Johannesburg in May 2008 that the media began to pay serious attention to it. This time around there has been load shedding since January, and there seems to be a similar rise in xenophobia. But perhaps it's just coincidence and nothing more. I questioned that, because I think that rage is the very thing that is driving xenophobic violence. My friend responded by saying that we should look at our own complicity. Aye, there's the rub. A few weeks ago a friend of mine, Artemius Mangena, was shot by robbers and spent some weeks in hospital. He mentioned that he overheard the robbers speaking Shona, and I felt an instant surge of rage -- xenophobic rage. There's my complicity. Sometimes it doesn't surface as rage, but as mere prejudice, as when I was introduced to a Nigerian, and my first thought was "drug dealer". Complicity again. Artemius, from his hospital bed, told me he didn't blame anyone for what had happened to him, but prayed for them, and I was reminded of my complicity again. Here's a photo I posted in the article referred to above, which shows Artemius (in the green shirt). The photo was taken soon after the 2008 xenophobic violence in Atteridgeville. I regarded the pagan roots of Easter to be an uncontroversial matter. For a start, the word itself, “Easter”, is usually regarded as being derived from Anglo-Saxon forms such as “Estara” or “Ostara” (and cognates) associated with a dawn goddess and common spring festivals celebrated in the British Isles and Northern Europe long before Christianity. According to some, those associations extend back to the Babylonian deity Astarte. More obviously, the ubiquitous egg given as a gift (or munched as a chocolate indulgence) at Easter is a widely employed fertility symbol that signals the rebirth of vegetation and the end of animal hibernation after the northern hemisphere’s winter. What was suprising was not that this was posted -- at this time of year one finds all sorts of fluff pieces like this in newspapers, usually written by junior journalists after half-an-hour's research using Internet search engines. No, the surprising thing was that this was written by a person who claims to have done doctoral studies, and to have taught religious studies at academic insitutions, yet has swallowed the modern urban legends of "Eostre/Ostara" so uncritically. To start with the title, someone who teaches religious studies should know that the ones who spread these urban legends most assiduously are the very Fundamentalists whose certainties he claims to be scuppering. 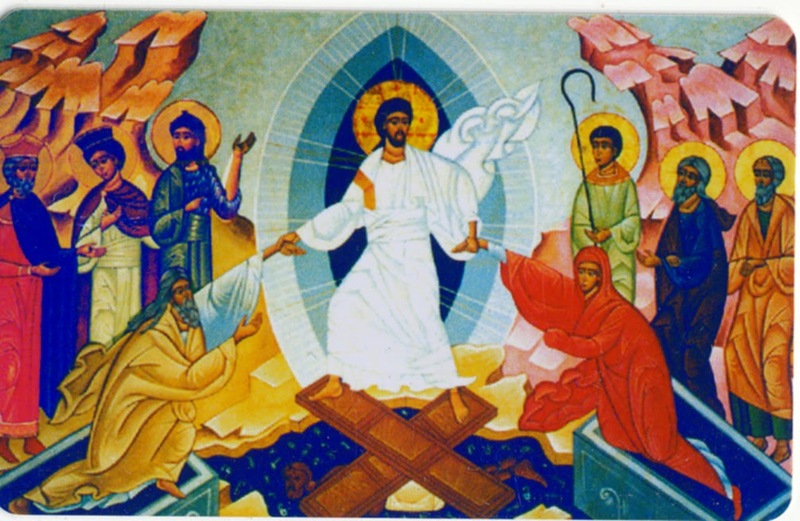 On the point that Christians took over pre-existing pagan beliefs, festivals, etc., it is largely bogus about Easter and Hallowe'en (the latter is almost certainly a pagan borrowing from Christians) and debatable in the case of Christmas. 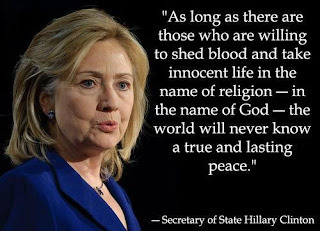 The thing that Christians most demonstrably borrowed from pagans is hell -- see Go to Hell. One point perhaps worth emphasising here is the one about Easter eggs as fertility symbols etc. The author of the article gives no evidence of this claim, but may perhaps have heard of Occams Razor. In trying to explain or predict some phenomenon, the fewer assumptions one makes the better. And the simplest explanation of the phenomenon of Easter eggs is that Christians traditionally fast during Lent, which, among other things, means abstention from eggs for 50 days, so breaking the fast with eggs should not come as a surprise. Nowadays Christians in the West are more likely to fast from chocclate, so perhaps the custom of eating chocolate eggs is also appropriate. I know that many modern pagens dislike the "neo-" prefix, and prefer to be known simply as pagans, but since I've never heard this claim made by paleopagans, I have used the term "neopagan" here. The trouble with reading these Roy Grace books out of order is that the baby keeps popping back into the womb, and in this case it is made more complicated by flashbacks to 12 years before, so keeping track of the action gets a bit complicated. It's nevertheless a readable crime novel, though more of a police procedural than a whodunit -- the reader knows more than the police, and so it is easier to work out who the perpetrator is. Roy Grace also seems to make some serious mistakes this time. Saying what they are would be giving too much of the plot away, but even though the reader has more clues than the police, Grace seems to miss some of the clues that he does have. There are also some oddities of language. Is Peter James American, like Elizabeth George? I thought cars in the UK had number plates rather than licence plates. 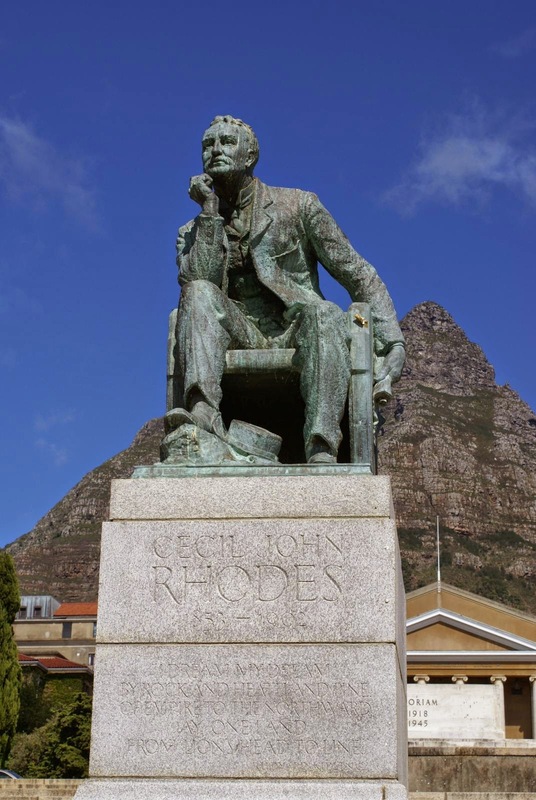 Over the last few days I've seen a lot of comments on Twitter and elsewhere about the statue of Cecil Rhodes at Cape Town university, and some students demanding its removal. Removing statues seems to be quite a popular activity, at least in some circles. At one point a couple of friends and I contemplated the possibility of starting a campaign for the removal of the Ideomeneo sculpture at Unisa. Unlike the Rhodes statue, it was abstract, represented nothing, and was quite inoffensive.The aim of the campaign would have been satirical, to demonstrate that so many of the things that the university administration got into a tizz about (in the late 1980s) were quite trivial. Nothing came of that, but the Taliban were much more serious about the destruction of Buddha statues in Afghanistan, which they accomplished expeditiously by using them for artillery practice, ignoring the protests of people all over the world. When US troops invaded Iraq in 2003 they lost no time in toppling a statue of Saddam Hussein, as a publicly staged media event. And more recently ISIL is clearly sufficiently well-supplied with munitions to destroy ancient buildings and monuments of no strategic value, but perhaps of symbolic value in trying to erase history. So they helped him on his way with some sticks of gelignite. As up went Nelson and his pillar too. So it seems to be quite a popular activity. Godfrey Mahachi, one of the country's foremost archaeologists picked by Mr Mugabe to be the director of Zimbabwe's National Museums and Monuments, said the grave was an important reminder of the country's colonialist past which could not be airbrushed out. The self-chosen burial place of Oxford-educated mining magnate and pioneer Rhodes in 1902, it still attracts thousands of visitors each year, bringing much-needed tourism revenue to the area. 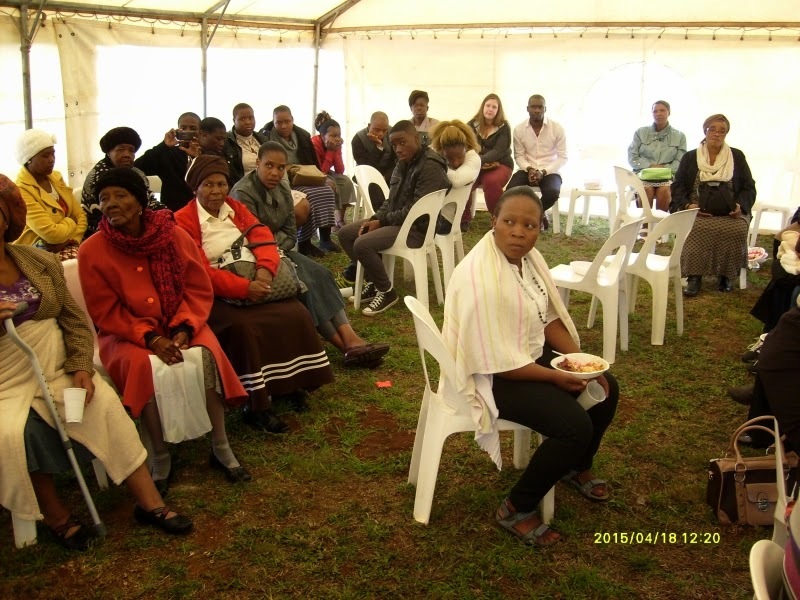 "The call for the removal of the grave is not new but our view is that it is part of national history and heritage and therefore it should not be tampered with," Mr Mahachi told the Zim Diaspora news website. So it seems that there are widely differing views on this. 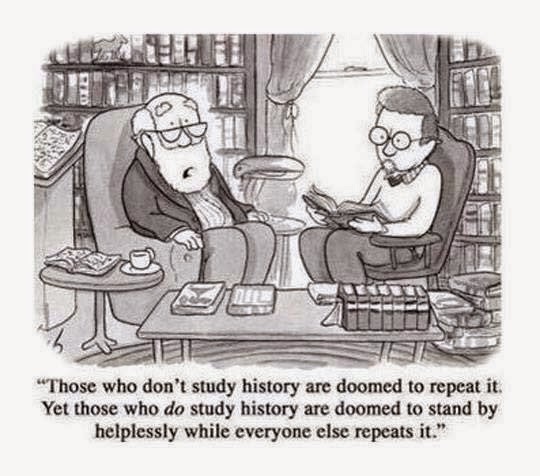 Since I have an interest in history, I tend to agree with the views of Godfrey Mahashi -- one cannot airbrush out the past, and when you do, it is all too easy to forget and repeat the mistakes of the past. As one person tweeted, in response to demands of students that the statue be removed, its removal would do nothing, absolutely nothing, to improve the education of those students. 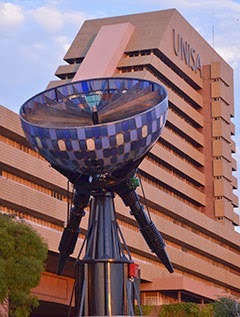 It has nothing, absolutely nothing, to do with "transformation", just as our fantasy campaign for the removal of Ideomeneo would have done nothing to facilitate the transformation of Unisa. Removal of some of the dead wood among the teaching staff would have done far more to achieve that, but instead Unisa chose to remove whistle-blowers who pointed out what was wrong with the teaching material. Cecil Rhodes was an excellent example of a businessman who became a politician in order to further his own business interests. And his statue can serve as a reminder of that very thing. 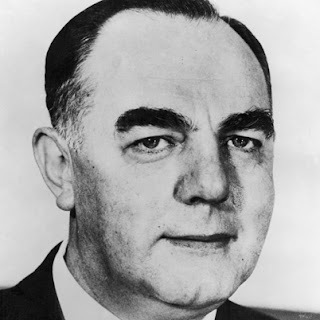 He made his money out of diamond mines, and when he became Prime Minister of the Cape Colony he secured a monopoly for his company. Let us look at his statue and remember. What should be removed is not the statue but the businessmen of our own day who go into politics to further their own business interests. Rhodes is dead, and can do no more harm. But his successors do harm every day. When Blogger introduced a new user-hostile blog editor, I moved this blog to a WordPress site here: Notes from Underground. But now WordPress has introduced an even more user-hostile editor (which they call "an improved user expeience"). But it is very difficult to compose blog posts on that experience, and the only thing I experience is frustration, so I'm moving it back here, at least until Wordpress provides a proper editor instead of an unpleasant experiece. One of the worst things about the Blogger editor is the loss of functionality, especially in posting pictures. It used to be possible to position pictures left, right or centre, but now one has to fiddle with the HTML code to do it, but even that is better that trying to edit stuff on the new WordPress experience. I din't think I would post again on this blog at this site, since I moved it to here.The main reason for moving was the new user-hostile user interface and reduced graphics functionality. But now something else has cropped up. I still have a family history blog on Blogger, which I still use occasionally. And they invited me to link the blog to Google+. To do so, however, I would have to merge my Blogger profile with my Google+ one. And, like most of the other changes, there would be a corresponding loss of functionality. You see, on the existing Blogger profile, there is a field for entering things you are interested in. On the Google+ profile there isn't. One of the things I am interested in is missiology. So if I go to my profile and click on any of my interests, say missiology, it will show me other bloggers who are interested in missiology. And in that case, I might also find their blogs interesting. It is a good way of finding blogs to follow. But now they want me to abandon that took by substituting my Google+ profile for my blogger one. Thanks, but no thanks. And since moving it to there, I've disabled comments on this blog. That's because abandoned blogs are a spammers' paradise, and they think they can leave spam comments to their heart's content. But the main reason for changing was the new user-hostile interface. A few months ago Blogger switched me to the new user-hostile interface, which I struggled with for a while, but then found a way of getting the old user-friendly one back. Now they've gone and switched me again, and hidden or removed all the things that made Blogger easy to use. Let's see if the new new one is better than the old new one. No, it isn't. I didn't want Jolly John's ugly mug in the middle of the page, I wanted it on the left, with the text wrapping around it to the right. But it seems that that functionality has been lost. Yes, it is possible to do it with a lot more time-consuming finicky editing of the HTML code, but why should that be necessary? Why did they take away the simple and easy-to-use interface that got me to sign up for Blogger in the first place, and replace it with a slow and clumsy one? The foisting of the new user-hostile Blogger interface on users was the last straw. In addition, it seems that a lot of the old functionality has been lost. Wordpress was always better for posting graphics than Blogger, but now it seems that the graphics capabilities of Blogger have been reduced still further, so it doesn't seem to be worth continuing. For many years I postyed to both blogs, depending on the requirements of the post, and the relative strengths of Blogger and Wordpress -- each one had its own strengths and weaknesses. But the latest changes are just too much, and it doesn't seem to be worth continuing. I'll leave this blog here for as long as Blogger is willing to host it, because there are links from other blogs and web sites, and I'd prefer not to break them. Broken links are one of the annoying things about the web, and I don't want to add to them. But I won't be adding any new posts here. 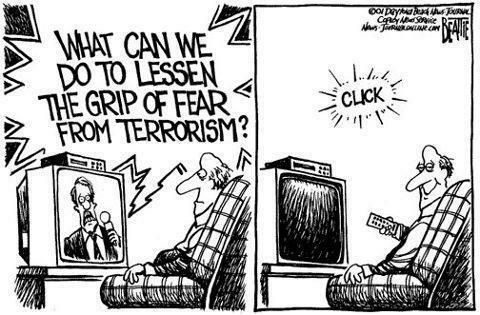 It tends to be the opposite of the "Occupy" movement -- 99% are bad or meaningless, and a waste of bandwidth. The words themselves aren't worth much, but on the principle that "a picture is worth a thousand words" people seem to try to give the impression that something is meaningful when it is actually meaningless by wrapping it up in pictures. Now perhaps this is all a matter of personal taste. I've occasionally "shared" a picture that I thought was true or witty, and some people have then liked my "status" (status? as in married or single? HIV positive or negative? 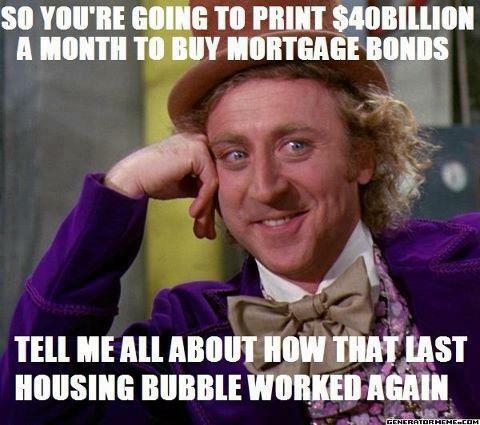 Employed, unemployed or retired? Refugee? Asylum seeker?). Here are some of the sillier ones I've seen recently. But in this one, the words don't matter, because I'm pretty sure the silly-looking git in the purple jacket and bow tie never said it at all. I've seen his face on Facebook dozens of times, with all kinds of opinions attributed to him, some of them utterly contradictory. But who is the bloke with the purple jacket and the bow tie? And does he actually know what opinions have been ascribed to him by countless thousands of Facebook posters? 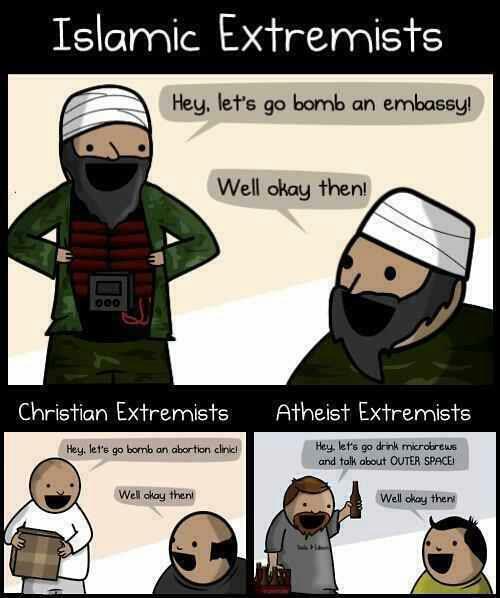 They are so contradictory that he can't possibly agree with them all. And why should his supposed endorsement make the sentiment expressed any more acceptable? I say nothing about the sentiment itself -- in this case the content is unimportant. It's just a question of why this guy's endorsement is thought to be important. It's about as silly as those old advertisements in the 1940s and 1950s that showed an actor in a white coat endorsing a particular brand of toothpaste. Which just goes to show that it's probably all a matter of taste, after all. Val was moving bricks from one side of our ruin to the other, but our dog Samwise kept making things difficult by trying to bite the wheelbarrow wheel. 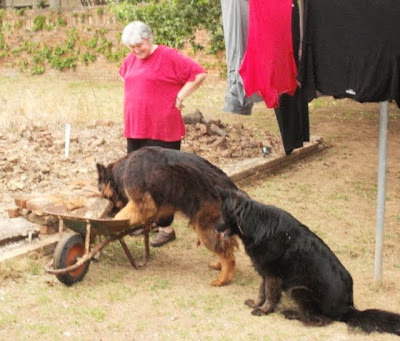 Then he dropped his ball into the wheelbarrow. "There it is, throw it for me." Val ignored it and kept loading the bricks, and Samwise got more and more agitated as his ball disappeared under a pile of bricks. Eventually Samwise could take it no more, and started moving the bricks to retrieve his ball. Once he had it, he retired to a safe distance and looked repoachfully at those who would not throw his ball, but hid it under brioks.